1 day course on the basic principles of Environmental Technology Systems. This QCF level 3 course is designed to teach delegates how environmental systems such as solar pv, heat pumps, solar thermal, wind and biomass operate to generate renewable heat or electricity. The entry level qualification is aimed at those with no or very little prior knowledge and experience of Environmental Technology Systems. Aside from covering the principles of each technology, the course goes briefly into the funding mechanisms behind each technology, including the Feed-In Tariff and Renewable Heat Incentive. For those looking to expand their knowledge of building based environmental technology, the Renewable Technologies in the Built Environment course may also be of interest. The qualification will also provide underpinning knowledge for installers wishing to undertake other qualifications, such as installation or design, for these renewable technologies. 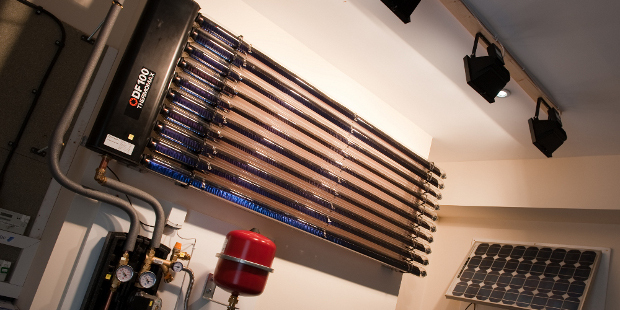 In addition to the technical principles behind each system, a brief introduction into funding mechanisms for technologies is given including the Feed-In Tariff and Renewable Heat Incentive. The final assessment for the energy efficiency course is in the form of a written assessment and multiple choice exam paper. None, but the target group for this qualification are those learners who are looking to become involved in the renewable energy industry.